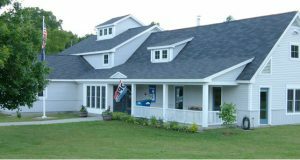 In 1990, the Hartland Friends of the Library, a non-profit organization, was created to improve library services and facilities through support and fundraisers such as holiday pie and cookie sales, donations, grants, and bequests. That same year, Hartland residents and the Friends of the Library came up with an ambitious plan for a new library: the one you see today. The library still needs ongoing community support and becoming a member Friends of the Library is a wonderful way to do that. The Friends also sponsor several fundraising events throughout the year, like the annual book sale on July 4th. You can also support the Friends of the Hartland Public Library everytime you shop at Amazon! Go to https://smile.amazon.com and search for the Friends of the Hartland Library. Funds raised help pay for library programming and special projects and equipment for the library. Please contact the library 802.436.2473 or director@hartlandlibraryvt.org for further membership and volunteering information.